Automatically back up MySQL database and send the backup files to an specified email box ( Gmail, Yahoo Mail, Live Mail, Hotmail, AOL Mail, Outlook, etc. ). Automatic Backup Scheduler for MySQL > Tutorials > How to back up MySQL database to Email box automatically? If you always concerned about MySQL backup files missing, please send them to an Email box. If you feel it trouble, you can try the software Automatic Backup Scheduler for MySQL to help you. The software can automatically back up MySQL database and send the MySQL backup files to your specified Email box ( Gmail, Yahoo Mail, Live Mail, Hotmail, AOL Mail, Outlook, etc. ) after each backup. You can specify multiple recipients(To, CC and BCC). It support SSL protocol and proxy server. 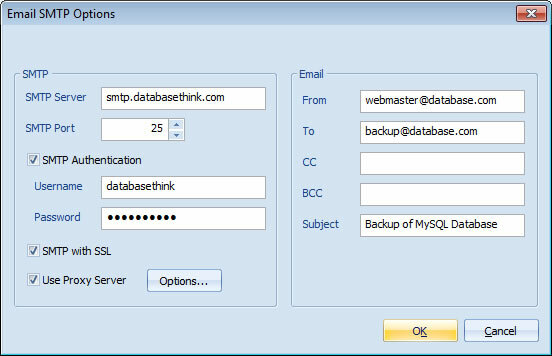 Step 3: Choose the option Send the backup files to an Email box via SMTP. 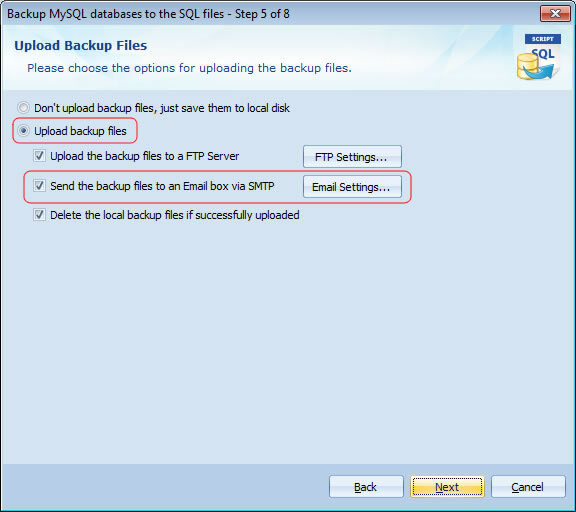 Please choose the option Upload backup files and Send the backup files to an Email box via SMTP on Step 5 of the Task Wizard. Please click Email Settings... to set up the SMTP options. If you want to encrypt the backup files , please compress the backup files to a ZIP file with password on Step 4 of the Task Wizard. Step 4: Set up the Email SMTP options. Please enter the information of your SMTP server. If you have no SMTP server, please click here to learn how to use free SMTP server. SMTP Options: Please enter the correct information about your SMTP server. If the SMTP Server should communicated with SSL Protocol, please check the option SMTP with SSL. If the SMTP Server should communicated with Proxy Server, please check the option Use Proxy Server and click Options... to set it. Please enter the correct email addresses on your SMTP server into the fields. Please separate the recipient's email addreddes(To, CC and BCC)by semicolons (;). Please click Next and choose the Task Scheduler for running the task on Step 7 of Task Wizard to send the backup files to your Email box on schedule. That's all. The software will automatically send the backup files to your Email box every time.